Several articles I’ve read lately strike me as worth sharing. I’m not sure what I think about all of this; perhaps Boredom is so related to Time that it’s one of those realities that I could muse on for a long time and get more and more confused – but never bored! Read the whole article here. 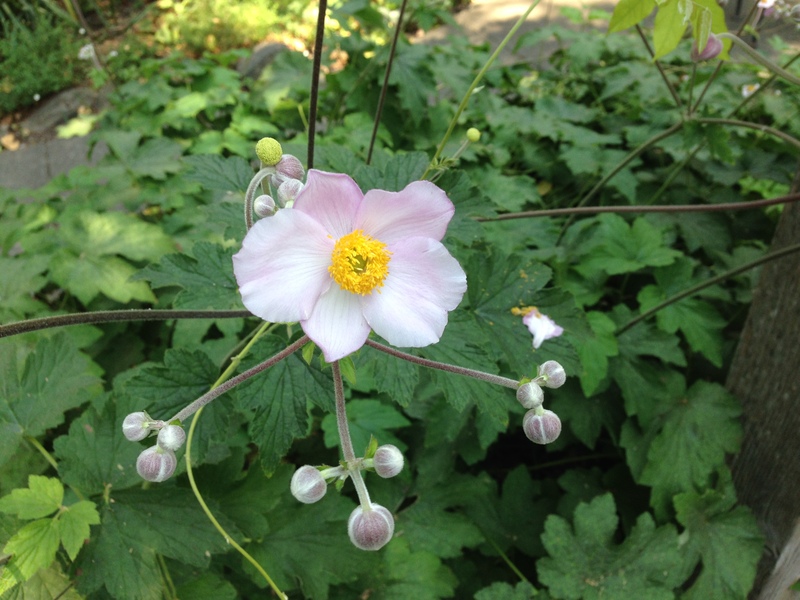 He contrasts that with “crystallized intelligence,” which is what we get more of in offline learning, “…the ability to use experience, knowledge and the products of lifelong education that have been stored in long-term memory.” This kind of learning leads to wisdom, and goodness knows we need that. Read the whole article here. Fr. 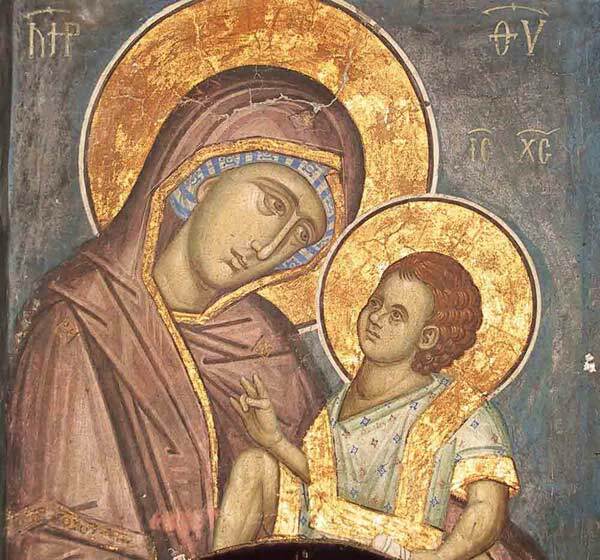 Stephen Freeman’s re cent article “Why the Orthodox Honor Mary” begins a discussion that continues in the resulting comments, contrasting the humility and submission of Mary as something to recognize and emulate, with the actual veneration of her as an aspect of our worship of God. A fascinating bit of Bible exposition is in the comments where Fr. Stephen explains Jesus’s words to Mary at the marriage of Cana, and the meaning that becomes clear when you see that they hearken back to the story in I Kings of Elijah and the widow of Zarephath. Read it all here. To end on a lighter note, how about some coconut cake to have with your iced tea on a summer afternoon? (If you are in the Southern Hemisphere, even better – just make that hot tea.) 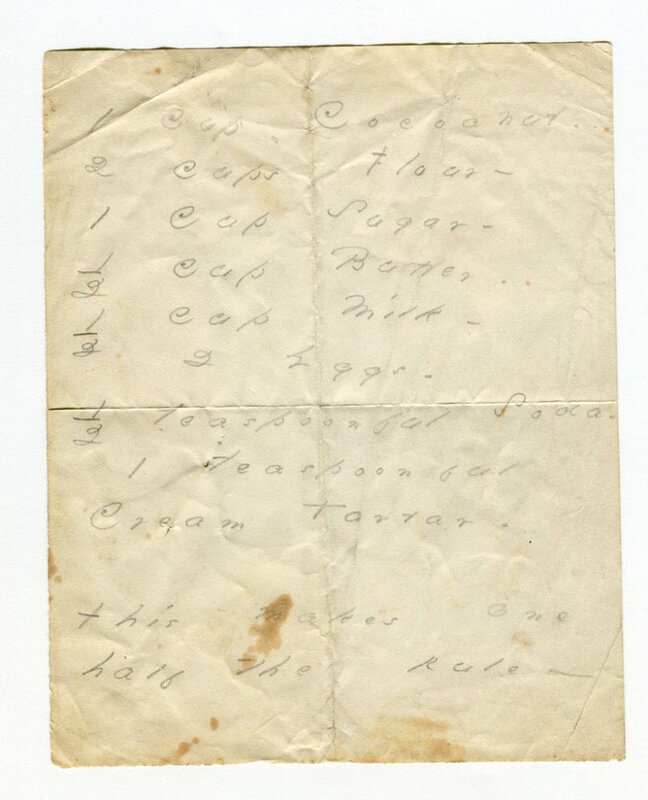 This picture of Emily Dickinson’s Handwritten Coconut Cake recipe, and the accompanying text, do encourage me that if I get back into the kitchen more, it won’t necessarily mean a lessening of my writing output. I do wonder what the form of the coconut ingredient is intended to be, but it would be fun to experiment with one of my favorite foods. As I write, the sun has yet to emerge in my cool corner of California, but by mid-afternoon the situation will probably have changed enough that I could sit outdoors with some tea and some more reading material from which to glean. Happy reading to you, too! Our mother has fallen asleep. 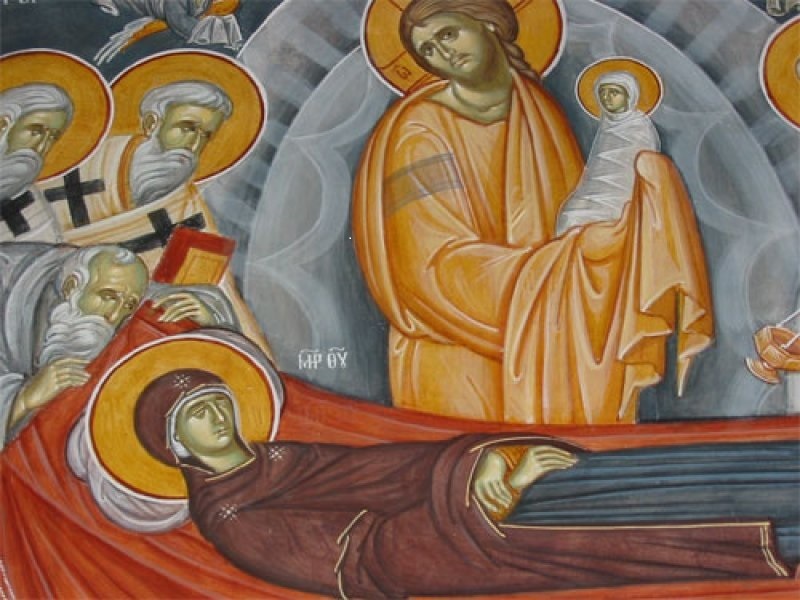 Today is the Feast of the Dormition, dormition meaning falling asleep. Our rector in his homily mentioned a couple of things that made an impression on me. Mary is not “the great exception” as some might teach. But she is our Great Example. She loved God and said “Yes” to Him, she bore Him in her heart and soul as well as in her body, and because of this love she suffered painfully with him as she stood by the cross. Loving God was everything to her. This love was expressed at the Incarnation and in its icon where we see her holding Christ in her arms. 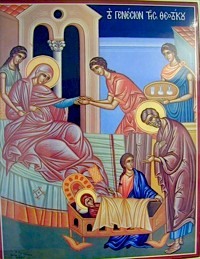 But in the icon of the Dormition, the detail shows Christ holding her in His arms. And of course that is where we also want to be when we fall asleep, with the resurrected Lord Jesus Christ. Son of God, Son of Man…God descending and becoming man so that man could become divine, could become partaker of the divine nature (2 Peter 1:4), or as the teachers of Church expressed it, “deified.” Precisely here, in this extraordinary revelation of man’s authentic nature and calling, is the source of that gratitude and tenderness which cherishes Mary as our link to Christ and, in Him, to God. And nowhere is this reflected more clearly that in the Nativity of the Mother of God. Nothing about this event is mentioned anywhere in the Holy Scriptures. But why should it be? Is there anything remarkable, anything especially unique about the normal birth of a child, a birth like any other? The Church began to commemorate the event with a special feast…because, on the contrary, the very fact that it is routine discloses something fresh and radiant about everything we call routine and ordinary, it gives new depth to the unremarkable details of human life…And with each birth the world is itself in some sense created anew and given as a gift to this new human being to be his life, his path, his creation.